The Centre is located in rural Bath Township. It is near Lansing, East Lansing, Haslett, Okemos, DeWitt and Saint Johns, three quarter hour from Jackson, about an hour from Ann Arbor and Grand Rapids, one and a half hours from Detroit and four hours from Chicago. Please note: The old US Route 27 has been replaced by expressway US-127, which is about a mile east of what is now called "Old 27" or "Business 27". You might still hear references to "US-27" or see it on old maps. Old-27 runs through the towns of DeWitt and Saint Johns (north of Lansing), while expressway US-127 goes around them. Follow I-96 West towards Lansing to US-127 (which runs concurrently with I-496 for a few miles). Take US-127 North to I-69 East towards Flint. (Take care not to follow I-496 off to the left into downtown Lansing. To remain on US-127 you must follow "Exit 8", which is actually just the right two lanes of the expressway.) Then follow the directions below from the US-127 and I-69 interchange. Take I-94 to I-69 North. Once in the Lansing area, be aware that I-69 temporarily merges onto I-96 on the west side of Lansing. You will need to pay close attention and leave I-96 at Exit 91 to continue on I-69 East for 10 more miles to US-127. Follow the directions below from the US-127 and I-69 interchange. Take US-127 South toward Lansing, then turn East onto I-69 towards Flint. Follow the directions below from the US-127 and I-69 interchange. Follow I-69 East toward Flint to exit 92: Webster Road, Bath. 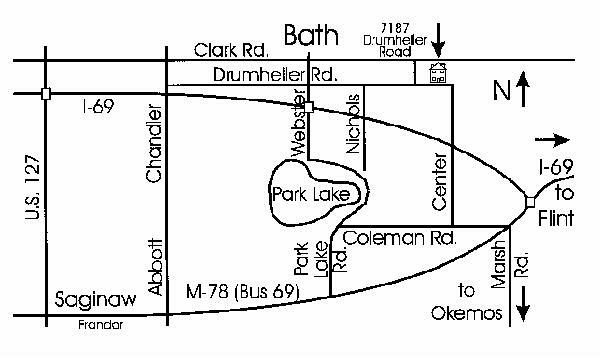 Turn right on Webster and go a half mile north to Drumheller Rd, turn right. The Centre is 1.5 miles on the left. Please note, the first 1.25 mile is gravel; after pavement begins, the Centre is at 7187, the third house on the left, the last before an abrupt right curve in the road. Follow I-69 West to exit 94: Marsh Road, East Lansing. Turn right on Marsh Rd. Where Marsh Road ends in front of the church (Coleman Rd) turn left, go about a quarter mile to Center Rd. Turn right, go about 2 miles, over Freeway, past an S-curve at Stoll Rd to a sharp left curve in the road. Immediately after the curve, turn right into the driveway. There is not a street name sign, but the road becomes Drumheller at that curve. Turn right into the driveway of the Centre at 7187. The Centre is a large brown two-story house, set back from the road. There is a white sign with the Centre's name and symbol to the left of the driveway. Parking is available on either side at the beginning of the drive. (Please note that GPS devices often show the Centre west of where it is: the driveway is actually at the east end of the paved segment of Drumheller Road.) Feel free to park at the building to unload or if you would have difficulty walking from below.